AMRO maintains forecasts for 2018, 2019 but warns of risks Philippine economic growth is expected to pick up this year and the next but a trade war between the United States and China could pose downside risks, a regional surveillance unit created under the Chiang Mai Initiative said. The Asean+3 Macroeconomic Research Office (AMRO), which on Thursday released its “Regional Economic Outlook 2018” in one of the side events of the Asian Development Bank’s annual board of governors meeting in Manila, also warned that the Philippines was already in the late stage of the business cycle – a condition that it claimed warranted monetary policy action. The Singapore-based AMRO was created to support the Chiang Mai Initiative, a multilateral currency swap arrangement formed by the 10 members of the Association of Southeast Asian Nations and trading partners China, Japan and South Korea to prevent a repeat of the Asian Financial Crisis. 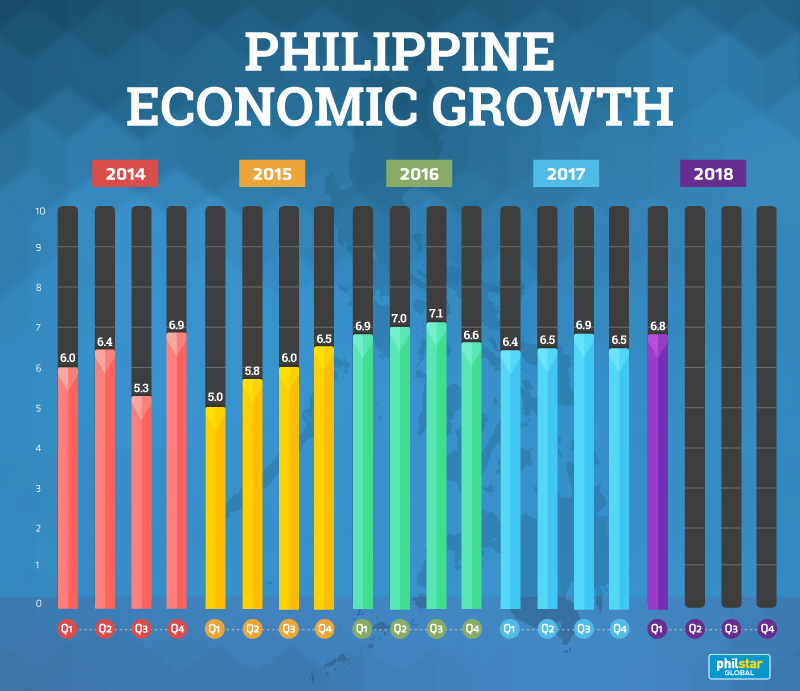 In the report, AMRO said it was keeping its Philippine gross domestic product (GDP) growth forecasts at 6.8 percent and 6.9 percent for 2018 and 2019, with exports and government spending the likely drivers. The estimates represent an improvement from last year’s actual growth of 6.7 percent but are lower than the official 7.0-8.0 percent target. A potential growth risk — not just for the Philippines but also for the rest of the region — could come from a brewing trade row between the US and China, the AMRO said. “On the simulation of a hypothetical scenario of a very limited trade war between the US and China, both countries could lose 0.2 percentage points of growth within the first year and an additional 0.2 percentage point for the US by the third year,” AMRO Director Junhong Chang said. “The net impact according AMRO estimates is that for advanced economies in the region such as Japan, Korea and Singapore [this]could range from 0.2 to 0.8 percentage point of growth, and among the emerging markets in the region, the impact is quite smaller but still significant, ranging from 0.5 percentage point,” she added. AMRO chief economist Hoe Ee Khor, meanwhile, pointed out that growth in the Philippines — and also in Japan — was running above potential or had strongly picked up recently and was also exhibiting signs of inflationary pressures or external imbalances. “In the case of the Philippines, it has also been growing strongly and there are signs that inflation has picked up. There are also pressures in the balance of payments as the current account began to widen,” he said. Domestic inflation surged to 4.3 percent in March from February’s revised 3.8 percent — surpassing the top end of the central bank’s 2.0-4.0 percent target range — based on 2012 prices. The current account deficit, meanwhile, more than doubled last year as merchandise imports outstripped outbound shipments. The 2017 shortfall ballooned to $2.5 billion from $1.2 billion a year earlier and was equivalent to 0.8 percent of gross domestic product. Khor noted that the rise in inflation was partly due to higher taxes – the impact of which “will come off again” – and added that the wider current account shortfall could also be considered “a good deficit because it will increase the productive capacity of the country”. Still, the AMRO said policymakers should consider recalibrating monetary and fiscal policies so that the economy can avoid a downturn and transit smoothly to an early or mid-cycle phase. “Regional economies that are in late business cycles could consider a tightening monetary policy bias, in view of emerging signs of inflation, subject to their inflation targeting monetary policy framework,” it suggested. The Bangko Sentral ng Pilipinas (BSP), however, downplayed the concern with a senior official saying that above-trend growth was still very consistent with latest estimates of potential output. “It depends on what kind of potential output the AMRO has computed. In our case it is between 6.5 and 7 percent,” central bank Deputy Governor Diwa Guinigundo commented. He said the government’s launch of an ambitious infrastructure program would ensure sustainable growth in the long run. “In short, what the Philippines trying to do is very much consistent with AMRO’s prescription to engineer a bypass from late to perhaps middle or early phase instead of a downtime or contractionary cycle,” Gunigundo added. In terms of monetary policy, central bank Governor Nestor Espenilla Jr. stressed that monetary authorities would position policy based on their assessment of inflation data. “We keep on looking at the data and the data flow suggests that our concerns may be elevating in terms of inflationary pressures and expectations moving up,” he said. This will be tackled when the BSP’s policymaking Monetary Board meets on May 10, Espenilla said.